The team from Vicenza ended the first racing day with a double one-two-three. Eddie Cheever and Henrique Martins obtained a victory each. Maisano ended third and second. 31/03/2012 - Prema Powerteam ruled at the Ricardo Tormo of Valencia. The team led by Angelo Rosin and Grazia Troncon did not give any space to rivals on the podium in the first two races of the season. In race one the victory went to Eddie Cheever, while the second race was won by the Brazilian Enrique Martins at the debut here. In race one, the American driver pulled away and led the race from lights to flag. Behind him finished Henrique Martins as he managed to keep at bay the Frenchman of Ferrari Driver Academy that had to contempt himself with the lowest step of the podium. Fourth was the "ironman" of Valencia, Sergey Sirotkin (Euronova). The driver from Moscow obtained the fourth position in the first race of the Italian Formula 3 European Series but also won the first race of the Auto GP championship. The Spanish weekend will see the Russian driver competing in 4 free practice sessions, 2 qualifying and 5 races. Fifth at the chequered flag was the Catalan driver Gerard Barrabeig (Ghinzani) who gained two positions from the starting grid. Sixth was Patric Niederhauser (BVM) who reached the Spanish track with just one test on his scoreboard. The Swiss nicely declared that this was in reality his first test on a Formula 3 Dallara. Riccardo Agostini (JD Motorsport) was only seventh who did not manage to keep his starting position with the only Mygale on track. Mario Marasca (BVM) produced a poor start but manged to get the ninth place anyway despite finishing lap one at the back of the group. 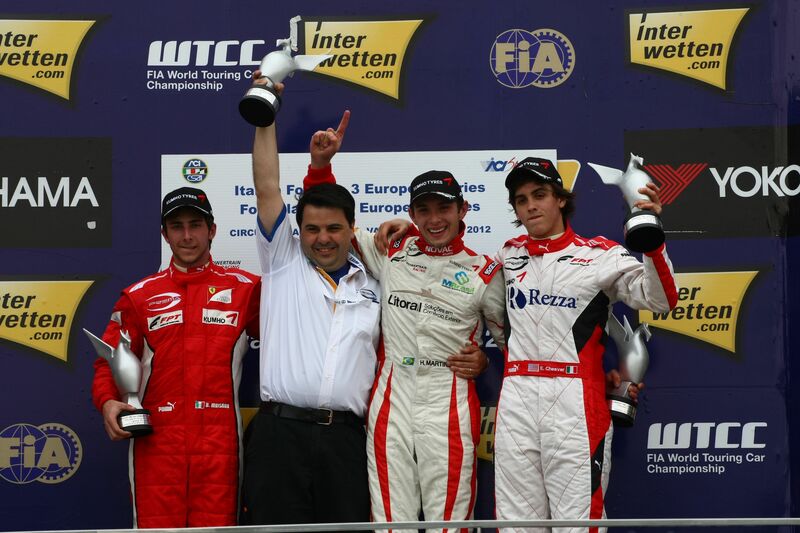 Race two was much more spectacular for the eleven protagonists of the Italian Formula 3 European Series. The three drivers of Prema started on the top three positions but swapped their roles due to a unhappy get away of Eddie Cheever that kept the door open to the young Henrique Martins that overtook him as Brandon Maisano did. The three were very close for the whole race but at the end Henrique Martins managed to win his second race in Formula 3. Maisano crossed the finish line in second followed by Cheever. The fight for the fourth position was quite tight and was won by Riccardo Agostini who had the best of the home driver Gerard Barrabeig. Very good was Mario Marasca's race (BVM) until the last lap. The driver from Latina overtook Sirotkin at lap four, three laps afterwards he also overtook Visoiu. On lap 19 Marasca unfortunately pushed too much under braking to take Barrabeig and went wide at the last corner. Sixth was therefore Sergey Sirotkin (Euronova) who was followed by Robert Visoiu (Ghinzani). Mario Marasca ended only eighth followed by Yoshitaka Kuroda (Euronova), the young Nicholas Latifi (BVM), at his first year on in single seater racing, and Patric Niederhauser (BVM) who will start from the pole position tomorrow and will have new tyres. The sprint race is scheduled for tomorrow at 11.20 (GMT+2) and will be shown on TV by Rai Sport 2 at 23.00.